It looks so easy when our heroes from the sci-fi movies swing their lightsabers through the air to defeat their enemies with a humming beam of light, or pulverize entire spaceships on high-speed chases by deploying a few salvos of high-density light energy. In reality, laser weapon technology is far from straightforward. High energy and space requirements and low efficiency have so far been obstacles to the development of laser weapons. But now, with the new generation of diode-pumped solid-state lasers, these obstacles have been overcome. What has not changed, however, are the strict accuracy requirements, which pose a massive challenge to weapon developers. 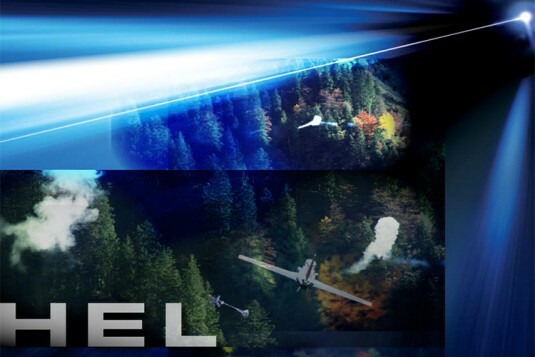 With its high-energy laser effector (HEL), Rheinmetall Defence last year made another important step toward a field-ready version of this groundbreaking technology. Rheinmetall has not only increased the laser power on the dynamic target over a distance of 3,000 meters but also made the laser weapon mobile. “We combine innovative laser weapon technology with decades of expertise in the construction of military effectors and technological leadership in air defense systems,” explain the employees in CTI, the main department responsible. “This will prove especially useful in the fight against small and highly mobile targets.” The systems supplier showcased this weapon’s capability in mid-October 2013 at the 4th high-energy laser live demonstration at the company’s own test center in Ochsenboden in Switzerland. This event saw the first-ever deployment of mobile laser weapons in Europe: A 5 kW HEL was installed on the GTK Boxer wheeled tank, a 1 kW HEL on an M113 tracked vehicle, and a 20 kW HEL on an armored Tatra truck. In addition, a 30 kW laser was installed on a Skyshield gun turret. With its 1 kW laser (Mobile HEL Effector), the M113 demonstrated its potential application in ordnance clearance. The crew inside the armored vehicle searched for mines and unconventional explosive charges and lasered them from a safe distance, rendering them harmless at the high speed required for the scenario in question. The crew of the GTK Boxer wheeled tank used a 5 kW laser (Mobile HEL Effector) to neutralize an extra-heavy machine gun positioned on the bed of a traveling pickup without endangering the marksman. Proof that the laser was not hazardous was delivered by sensors mounted on the dummy, which recorded the scattered laser radiation levels during the entire process. Together with the Skyguard radar used in the Air Defence HEL effector, the effector also demonstrated its effectiveness against a completely new kind of threat: small rotary wing drones (octocopters). While the Skyguard radar took charge of detecting and identifying a hovering octocopter, the HEL Boxer tracked and destroyed it. With the 20 kW laser (Mobile HEL Effector) on the Tatra, Rheinmetall demonstrated how radio antenna, radars, ammunition, power supply systems and entire weapons systems can be neutralized or destroyed with minimum collateral damage. From a distance of 2,000 meters, optical devices such as telescopic sights on weapons and remote-control cameras were destroyed in seconds. With its Air Defence HEL effector, Rheinmetall demonstrated the performance of HEL in air defense scenarios. In around four seconds, the 30 kW laser weapon technology demonstrator destroyed five 82 mm mortar shells from a distance of 1,000 meters. The highlight of the demonstration in Ochsenboden came with the successful shooting-down of several jet-powered UAVs. As you can see, laser weapons are becoming increasingly powerful and are set to replace other technologies in the future as well as offer additional flexibility in the field. Laser weapons always play a complementary role alongside guns. However, they will not be the humming spectacle of color you see in the movies. Whether day or night, they are invisible to the naked eye – and also completely silent.